The Washington National Opera has commissioned an hour-long opera to be unveiled at the Kennedy Center in June 2013. “The Tao of Muhammad Ali (A Ghost Story)”—with libretto by Davis Miller—involves a reporter’s encounter with the boxing great. Recent premieres have included the Dayton Philharmonic, the Richmond Symphony Orchestra, the Williamsburg Symphonia, Eighth Blackbird, and the Amsterdam-based Hexnut Ensemble. 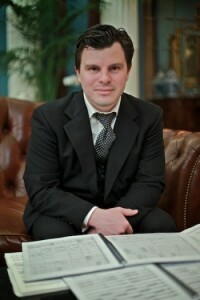 Sparr’s music has been commissioned and performed by groups such as the Albany Symphony, the Berkshire Symphony, Chicago Youth Symphony Orchestra, the Chinese People’s Liberation Army Band, the League of Composers’ Orchestra, the Los Angeles “Debut” Orchestra, New Music Detroit, the Pittsburgh New Music Ensemble, the University of Washington, the Verge Ensemble, Wet Ink and Yale University. His recent work “Precious Metal: A Concerto for Flute and Winds” was commissioned by a consortium of thirty-three colleges led by the University of Washington and was featured on their 2010 tour of Japan. D. J. was awarded the $10,000 grand prize in the orchestra category of the BMG/Williams College National Young Composers Competition and was an alternate for the 1998-99 Rome Prize. He received BMI Student Composer Awards in 1995 and 2000 and has received awards and recognition from the American Music Center, the Composers’ Guild, Eastman School of Music, George Washington University, New York Youth Symphony, and the Pittsburgh New Music Ensemble. An accomplished electric guitarist, Sparr has appeared as a soloist alongside conductors such as Marin Alsop, Joana Carneiro, Neil Gittleman, and Joachim Jousse. Mark Swed of the Los Angeles Times says,“D. J. Sparr was a terrific soloist.” and the Santa Cruz Sentinel writes, “Soloist D.J. Sparr wowed an enthusiastic audience…Sparr’s guitar sang in a near-human voice.” He has performed electric guitar concertos with the Filarmonica Arturo Toscanini in Italy, the Alabama Symphony, the Dayton Philharmonic, the Cabrillo Festival of New Music, and the Great Noise Ensemble. As a chamber musician, he has appeared with the Aspen Contemporary Ensemble, Eighth Blackbird, The Firebird Ensemble, and New Music Raleigh. D. J. is a sponsored artist of JHS Guitars in Vantaa, Finland; he plays the JHS Rocktor (D. J. Sparr signature model). D. J. sponsored composer Armando Bajolo’s successful application for a Fromm Foundation commission from Harvard University to write “Little Black Book” for solo electric guitar. D. J. is a graduate of the Eastman School of Music (BM) and the University of Michigan (MM, DMA). His principal teachers include Michael Daugherty, William Bolcom, Sydney Hodkinson, Christopher Rouse, Joseph Schwantner and Augusta Read Thomas. He studied with John Harbison at the Aspen Music Festival and the Oregon Bach Festival and was an Associate Artist-in-Residence under Aaron Jay Kernis at the Atlantic Center for the Arts. Sparr was the composer-in-residence for the Richmond Symphony’s Education and Community Engagement Department (2009-11); and has been a faculty member at the Walden School for Musicians. A native of Baltimore, Md., he lives in Richmond, VA with his wife Kimberly and their two dogs, Lloyd and Nannette.